A delicious way to try Spanish food is to get into the habit of ordering tapas with your drink. It's a lovely way to sample different dishes which you may not normally get to try. You can drink in the atmosphere at several bars while sampling a few snacks. Of course, you will also find tapas in any Spanish resturants in Alicante. Tapas are basically small food dishes to keep hunger pangs at bay. They are traditionally eaten at lunchtime instead of a full-blown meal or with drinks after work. It is thought tapas (from the Spanish word ‘tapar‘ meaning ‘to cover‘) originate from the custom of putting bread or ham over drinks to keep the flies off. The custom could also come from rural Spain in bygone days when the labourers put bread on top of their wine to keep the flies and mosquitoes away. This evolved over time into a culinary delight of its own. 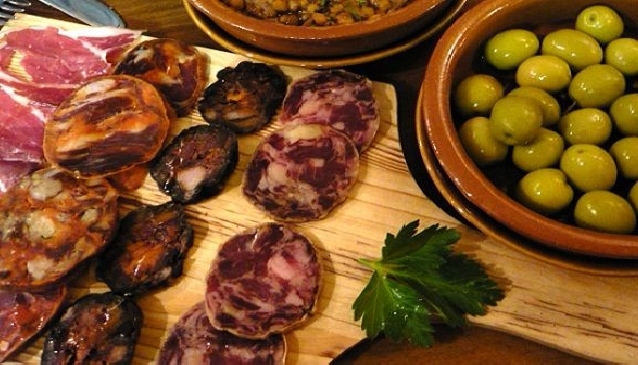 Many traditional bars have long displays of tapas with 100 or more varieties, ranging from fish, meats like ham and sausages, to tomatoes or eggs. Popular tapas in Alicante and the Costa Blanca include Russian salad (vegetable salad, tuna and mayonnaise), calamari (squid rings in batter), albondigas (meatballs in tomato sauce), revuelto (scrambled eggs), boquerones (little anchovies), gambas (prawns) or fish or cheese croquettes. It could also be a simple plate of cheese, jamon (Spanish ham) or sausage such as chorizo. Often it is accompanied with bread and alioli (garlic mayonnaise). The list is endless and many bars will have a vast range of tapas, which would be impossible to get through during one holiday. Out of season you will find some bars offering a small beer and tapa for €1 or €1.50 to try to attract attention. Most cost €3 to €5 but you could pay a lot more for one of the better jamons. Some bars still have several jamons hanging from the ceiling, which adds to the general ambience. The price is just one great attraction. Another is a chance to try something different. You could organise your own pub crawl around town so you stop at several different bars, order a beer or wine and try a different tapa in each one. At certain times of year, some towns such as Alicante, Elche, Benidorm, Orihuela, Calpe and Altea hold a tapas trail. Generally this is a week-long celebration of tapas where several bars and restaurants serve different dishes or invent a new one. Participants have the chance to vote for their favourite. We visited five Alicante resorts to help you on your way. But half the fun could be in inventing your own personal tapas tour. Surprisingly, one of the best tapas bars in Spain is in Alicante airport, where top chef Quique Dacosta, who has a two Michelin star restaurant in Denia, has opened Aire Tapas Bar. It's just inside the terminal building so you don't have to be a passenger to enjoy the food. It's also a chance to enjoy top-class food for a fraction of the price of a full-blown meal. The menu even tells you how long your food will take to prepare. 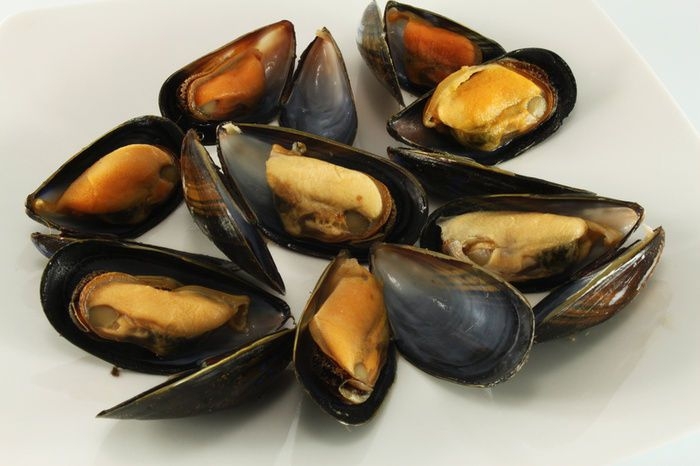 You could try razor clams with sea spaghetti, tiger mussels or potatoes with fried eggs and ham, for example. Another tapas bar which is highly recommended is Cerveceria Mavi in Foguerer, 9, in Alicante. It's an unassuming little bar in central Alicante but the food is delicious. It's good to try the seafood tapas here. If you can't get a seat, try the Cerveceria Sento in Teniente Coronel Chapuli, 1. The papas arrugadas (wrinkled potatoes) are legendary. It's another tiny classic bar with jamons lining the wall. Many people head to the little restaurant Xef Pirata, where the variety of tapas is excellent, particularly the truffle croquettes. It's a friendly little place where the burgers are pretty popular too. You could try a mini burger with your tapas if you like. You'll find it in the pretty old town in Calle Angel 22, on the corner of Cuesta de los Machos. Head to the marina, where you will find Xeito in Calle Sant Pere has very good tapas. It's a great location for enjoying a glass of beer or wine in the early evening, along with a dish or two of tapas. Try the croquettes, they're the best! The Bar Bocaito in Plaza de la Pau has a lovely terrace where you can enjoy the sun while sampling some traditional Spanish snacks such as garlic prawns, serrano ham, anchovies, mussels or cheese. There are dozens to choose from so take your time when ordering. The delightful old town in Benidorm is home to so many tapas bars that one area has been dubbed tapas alley by the Brits. Most of them are found around the Plaza de la Constitution and Santo Domingo. You could indulge in a mini bar crawl and take your pick of them. Don't go without trying a snack at Taberna Elizondo in Santo Domingo. 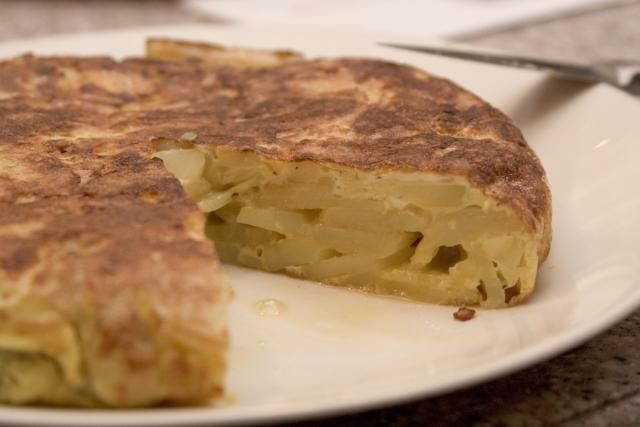 It's in a prime location and serves a good range including Spanish omelette, croquettes, baby squid and ham along with inexpensive but good wines. 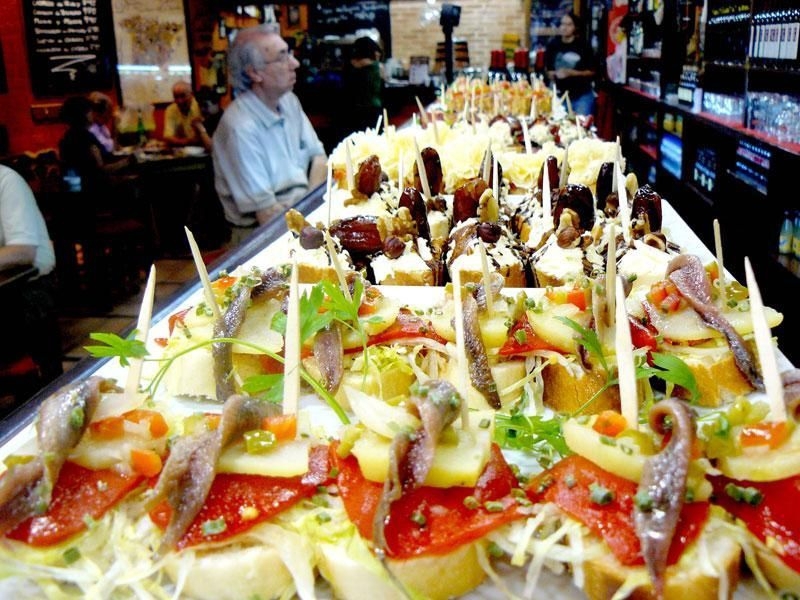 One of the best is Gambrinus El Jardin in Calle Tomas Ortuno, which is a traditional bar serving fine tapas such as garlic mushrooms, Russian salad, boquerones, prawns and mussels. 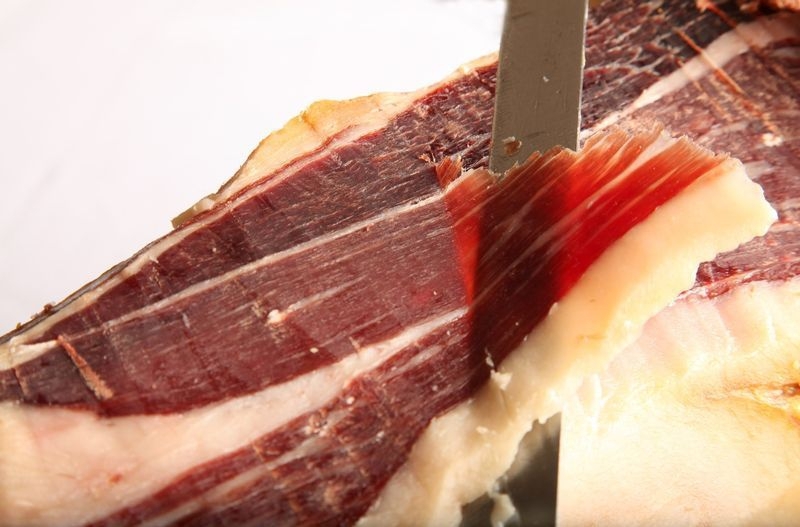 You could also try some tasty serrano ham or a plate of cheese. The interesting thing about this place is that the walls are lined with photos of Old Benidorm before the tourism boom. Look out for the photo of Levante Beach with just one house on it. Calle Loreto is a good place to start if you want a little bar crawl. La Seu does an upmarket menu of tapas including chargrilled octopus and clams. A quirky little bar further down this historic street is Miguel Juan, where hams hang from the ceilings while numerous Spanish wines line the walls. 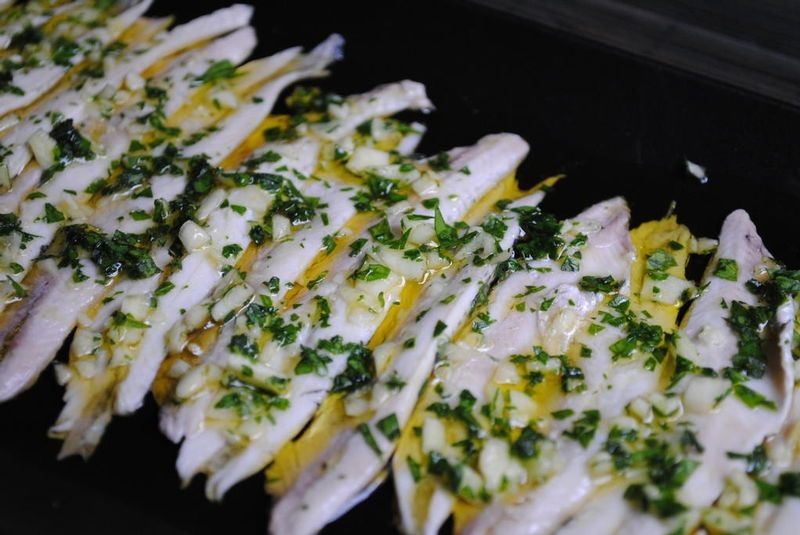 You can try bite-size local dishes such as mackerel, tuna or salt cod. A particular favourite is El Jamonal de Ramonet in Passeig Saladar, which is the same street as the train station. The long bar has numerous tapas to try while the opposite wall is lined with various hams, which gives it a very Spanish feel. The fish tapas are particularly good - look out for the Denia prawns in season - along with the spicy patatas bravas and jamon or ham. There are plenty of tapas bars to be found in and around Orihuela's historic city centre and cathedral. You can enjoy typical dishes such as meatballs, anchovies, calamari, salami or shellfish. Some bars will also serve more unusual dishes, particularly those restaurants which take part in the annual Tapas Route competition, where bars can win prizes for their tasty and innovative ways with tapas. Lo Mas Gus in Calle Castellon is a popular tapas bar and last year it won the Orihuela Tapas Route prize for the best tapas. Recommendations do not come much higher than that. It is only open in the evening but you can enjoy a glass of wine or beer with a few dishes such as succulent meat pies (which some argue are the best in Orihuela) or a prawn hamburger. The Melia Palacio de Tudemir in Calle Alfonso XIII is one of the best places to try tapas in the Alicante region. The hotel is in a restored 18th century palace and still keeps many of its historic charms. In the Bistro Cafe you can enjoy a variety of tapas, pintxos and fast foods. In Cerveceria Veronica, Ronda de Santo Domingo, you can work your way through their 50 tapas dishes, if you have time. The albonigas (meatballs) are particularly tasty. Wherever you go, whatever you do, the tasty tapas will add to the flavour of Spain.